Friday harvest. Each week, there’s usually one crop that kinda catches my eye: a perfect first cut of baby lettuce, lush green onions with straight white stems, or today’s chunky, crunchy bok choi (aka bok choy, pak choi). The variety here is Joi Choi, it’s worked out well over several seasons, slow to bolt, willing to roll with varying amounts of rain. This batch caught good conditions, with lots of sun and weekly rain. The stems are thick and crisp, and the leaves startlingly flea beetle unbitten, thanks to row cover and to the FBs dying down for the year. With minimal help…things worked out for these guys! Nice. 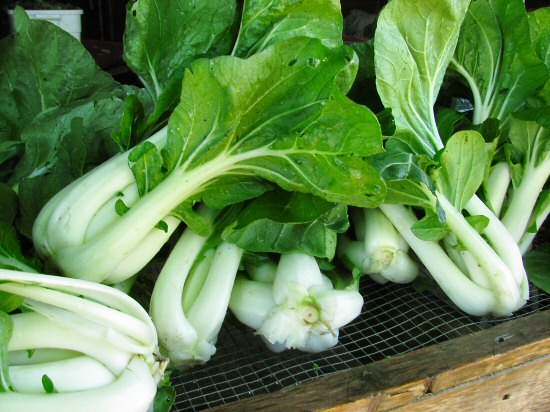 I am not to familiar with Bok Choi. How would you cook it or prepare it? Yet another gorgeous vegetable. 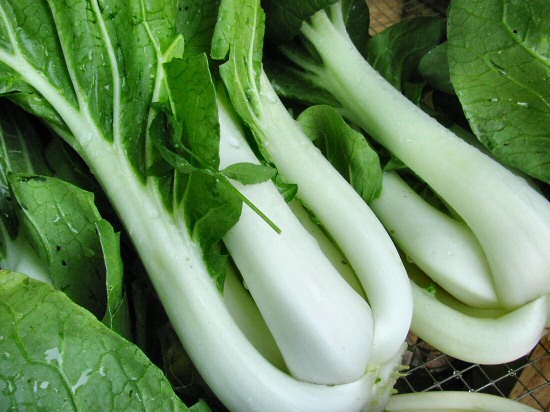 Nothing crunches like Bok Choi. michele: Cut up and stir fry! That’s the usual around here.